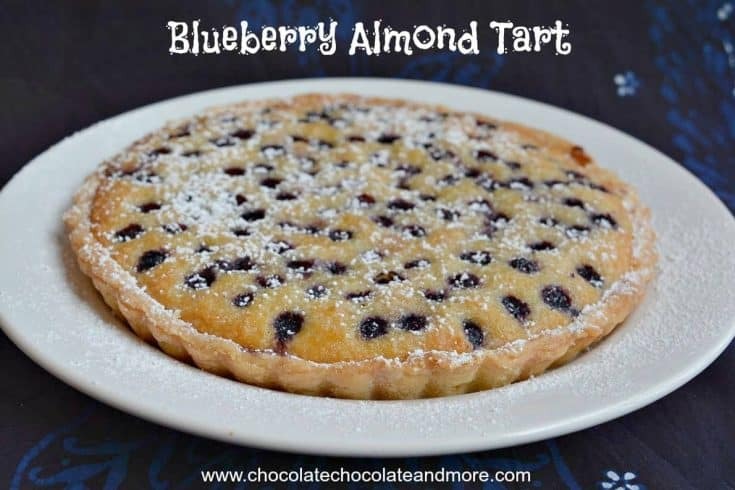 Blueberry Almond Tart - Chocolate Chocolate and More! Blueberry and almonds go so well together. 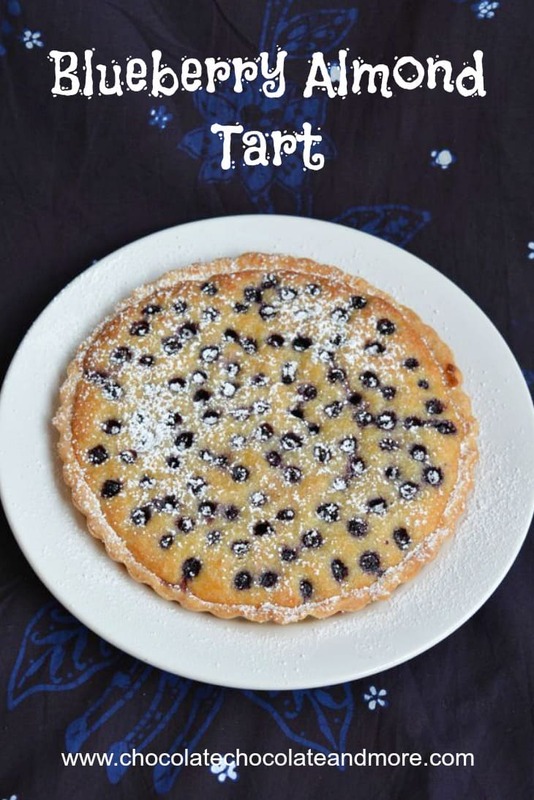 Serve blueberry almond tart with tea for an afternoon treat or indulge yourself with a slice for breakfast. I’m not a huge fan of raw blueberries but I love them when they’re cooked. Baking brings out the tart, juicy flavor. 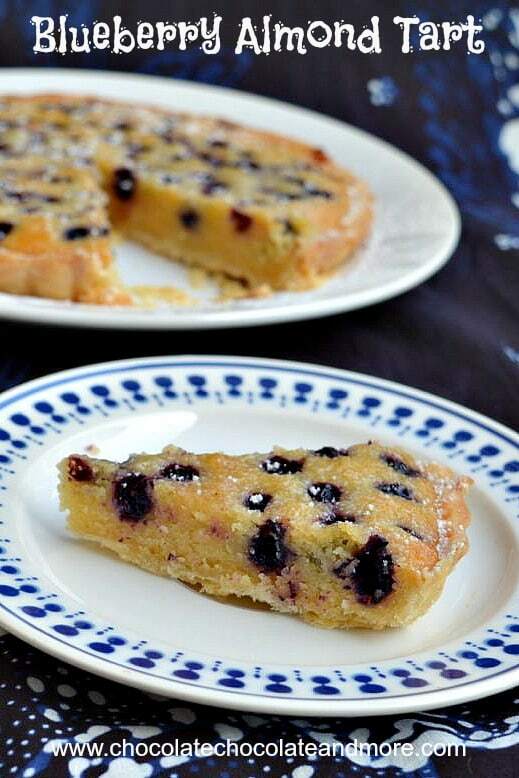 Blueberry almond tart combines tart blueberries and lemons with smooth almonds. The almonds also make the filling moist. I went to Macau at the end of last week. I’ve never been so I was looking forward to visiting a new place. It’s main claim to fame is as a gambling center. I’m not much of a gambler but I love history and Macau has an interesting one. It was settled by the Portuguese who intermarried with the local Chinese creating a culture that is a mix of both. I was presenting a paper at a conference so I didn’t have much time for sightseeing but Macau is pretty small. I did get to see the University of Macau. The campus is only 3 years old and it’s beautiful. I also got to walk through the old city and sample some Chinese almond cookies that were still warm. I’ve got to figure those out. A friend of ours who lives there took us out for the most amazing sangrias. This place filled a pitcher with ice. Then filled it about half full with red wine. They added maybe half a cup of orange juice and shots of about 8 liquors including gin, triple sec, peach and I didn’t catch the rest. They topped it with about 1/3 cup finely chopped apples and filled the rest of the pitcher (about 1/4 of the pitcher) with dry ginger ale. It was amazingly smooth. Since I didn’t get back home till 1 AM, I needed something easy for the post today. Blueberry Almond Tart fit the bill. I made it this morning and had slice for a late breakfast. I’m having a second slice with my tea right now. That leaves just enough for breakfast tomorrow. This recipe makes a 7 inch tart but if you want a 9 inch tart, just double the ingredients. Mix together flour, salt and powdered sugar. Cut in butter until you have fine crumbs. Mix in egg yolk and enough cold water to form a dough. Wrap in plastic wrap and refrigerate for 30 minutes. Lightly grease 7.5 inch tart pan. Roll out pastry dough into a circle about 8.5 inches in diameter. Fit into tart pan and refrigerate 30 minutes. Cut a circle of parchment paper and place on top of chilled pastry. Add pie weights and bake at 325°F for 25 minutes or until light golden brown. Mix sugar, butter, flour, and finely ground almonds together. Add in egg and lemon curd. 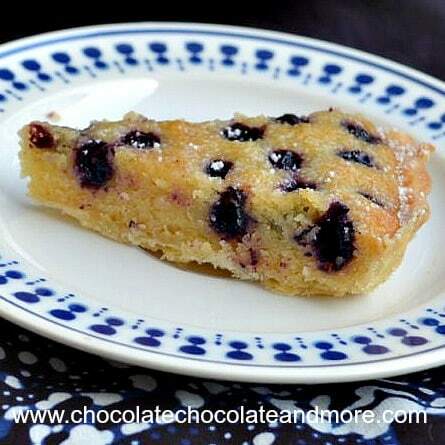 Fill the prepared pastry with the filling and press blueberries into the filling to make polka dots. Bake at 325°F for 40 minutes or until golden brown. Let cool in the pan. Dust with powdered sugar before serving. Nutrition information is based on cutting the tart into 8 slices and is provided as a guideline only. Please consult a dietitian if you have specific dietary needs. Thanks for this Great sharing and your site is amazing..
Wow, this would be perfect for a tea party with friends! If you don’t have pie weights can you ‘dock’ the crust and prebake? I have used dry beans for this purpose but, hubby, tossed them. The filling is pretty thick so you could probably just dock the crust. I had no beans or weights so I used roasted peanuts. I actually use nuts (as in nuts and bolts) at home because they are cheaper than pie weights and do the same thing.